Since nowadays the bathroom space has been elevated to an oasis of relaxation and tranquility, it’s essential to find a bathtub that suits your demands in terms of functionality and aesthetics. 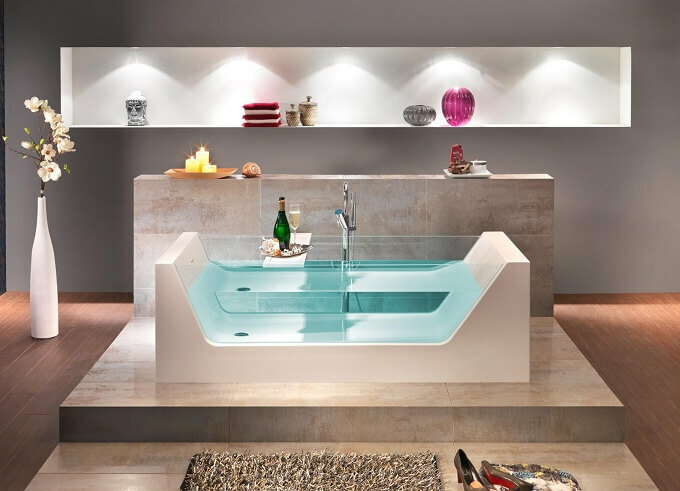 KNIEF & CO. GmbH, specialists with an extensive collection of acrylic bathtubs, were our inspiration for today’s post. Looking their amazing new catalog, we found this gorgeous bathtub and we wanted to share with you, in case you’re looking for something out of the ordinary. Make statements in quality and elegance and get your individual style to your bathroom with LOOK, a bathtub with special and unique freestanding design. Its striking shape is a pure power of attraction. LOOK is a modern interpretation of the traditional bathtub that best fits large spaces designed in modern minimalist style. The creative, clean design persuades through the interesting combination of materials; its sides are made of transparent glass, which transforms it into an eye catcher for your bathroom. Besides the fact that it ensures a relaxing, luxury bathing, optimal comfort and radiates a medidative peace, it does also enhance your bathroom interior design. It is produced exclusively in Europe, being guaranteed its highest material and processing quality. Below are some inspiring photos with LOOK to see how it can be framed.